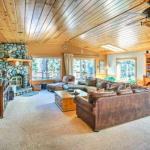 Boasting accommodation with a patio Cottonwood Place Vacation Home is situated in Tahoe Vista. Guests may enjoy free WiFi. The holiday home is equipped with 4 separate bedrooms and includes a kitchen with a dishwasher and a dining area. A flat-screen TV is available. The holiday home offers a barbecue. Cycling and hiking can be enjoyed nearby. Reno is 38 km from Cottonwood Place Vacation Home while South Lake Tahoe is 35 km from the property. The nearest airport is Reno-Tahoe International Airport 38 km from the accommodation.